Synthetic peptide within Human TCF7 aa 228-277 (internal sequence). The exact sequence is proprietary. WB: fetal thymus lysate. 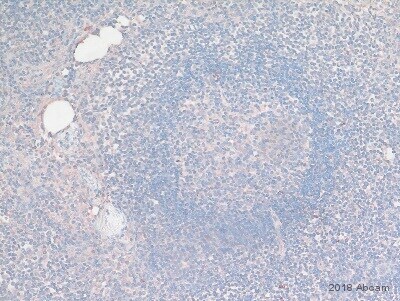 IHC-P: human kidney tissue. This antibody was purified by peptide affinity chromatography method. Our Abpromise guarantee covers the use of ab30961 in the following tested applications. WB Use a concentration of 0.125 µg/ml. Detects a band of approximately 49 kDa (predicted molecular weight: 42 kDa). Good results were obtained when blocked with 5% non-fat dry milk in 0.05% PBS-T.
Transcriptional activator involved in T-cell lymphocyte differentiation. Necessary for the survival of CD4(+) CD8(+) immature thymocytes. Isoforms lacking the N-terminal CTNNB1 binding domain cannot fulfill this role. Binds to the T-lymphocyte-specific enhancer element (5'-WWCAAAG-3') found in the promoter of the CD3E gene. May also act as feedback transcriptional repressor of CTNNB1 and TCF7L2 target genes. TLE1, TLE2, TLE3 and TLE4 repress transactivation mediated by TCF7 and CTNNB1. Predominantly in T-cells. Also detected in proliferating intestinal epithelial cells and in the basal epithelial cells of mammary gland epithelium. Immunohistochemistry (Formalin/PFA-fixed parraffin-embedded sections) analysis of human kidney tissue labelling Transcription factor 7 with ab30961 at 4-8µg/ml. Positively labelled cells (epithelial cells of renal tubule) are indicated by arrows. Magnification: 400X. Publishing research using ab30961? Please let us know so that we can cite the reference in this datasheet.